Adhesive tape is the combination of backing materials coated with an adhesive. Based on the purpose, different materials and adhesives can be used. The various types of adhesive tapes are listed below. Water activated tape - Water activated tape also known as gummed paper tape or gummed tape is starch or sometimes an animal glue-based adhesive on a backing with kraft paper which goes sticky when steamed. Heat sensitive tape - It is tack-free tape until it is stimulated by any heat source, it is sometimes used in packaging. A tear strip on cigarette packs is an example. Pressure-sensitive tape - Pressure sensitive tape otherwise called PSA tape or self-stick tape or sticky tape is a combination of backing materials coated with an adhesive. The backing materials include paper, plastic film, cloth, or metal foil, this adhesive tape is sticky without any heat or solvent for activation and adheres to light pressure. Drywall tape - Drywall tape is cloth, paper, or mesh, sometimes with a pressure-sensitive or gummed adhesive. It can be used to make the joints between sheets of drywall materials. For the detailed explanation about the making of an adhesive tape check out the below video. ​Do you ever think of the role of tape in your life? Though people are not aware of it they might have used them for multi-purpose uses in their home or other industries for wrapping, arts & crafts, spot repairs, packing, and other similar things. When considering manufacturing plant or business, they are also used for sticking, wrapping, etc. but do people are aware of the types of tapes they choose? 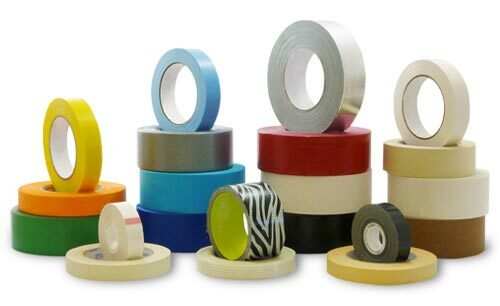 There are a number of tapes used for various purposes and uses, most of them know about the duct and cellophane tape, but this blog will list out the name of tapes in detail. Electric tapes are also considered to be the adhesive tapes are used for multi purposes from patching to insulating equipment in the work and construction areas to insulate electrical wires. There are six different types of adhesive tapes used for the various fields; they would be the best option to make the work easier, let check them in depth below. The adhesive tape of this type is highly preferred in the electrical industry for their high-temperature resistance and valuable & higher thermal conductivity. The adhesive tape of this type is used for various used and preferred for their capability of retaining different adhesive properties even during the extreme and robust temperatures. The adhesive tape of this designed to thin and therefore you can tear them easily and especially used for cartons packaging, apart from that they are also used for spray painting. The masking tape can be preferred in laboratories for labeling test samples; you can write on them easily as the texture is similar to a paper. Most of them prefer cellophane tape for performing different tasks, but they consist of some significant drawbacks like they cannot be used to stick any solid objects to the wall. In this case, a double-sided tape would be the best option as they come with an adhesive coating on either side. The adhesive tape of this type is made of cotton paper which is used for attaching any solid or flat objects to the wall surface namely picture frames, dolls etc. They are designed to be user-friendly, all you need to do is to stick the tape over one surface and then peel off the covering from the opposite side so that the object gets stuck together. One of the stronger adhesive tapes used for the multi-range uses is the Duct tape, they were primarily invented for sealing ducts, but at present, they are highly preferred by the customers to stick different objects. Duct tapes are the most versatile ones as they can stick or do other actions faster and also be best to be used on any materials. From the name you might have captured the use of the tapes, yeah they are used for electrical connections, they are made from high and robust insulating materials which make easier for them to get attached to the electrical appliances. The insulating property indicated that they could be used for repairing any cuts, damages and other hurdles on any electrical wires or other electrical features, the material used are plastic or Vinyl ensures the durability and effective insulation. The electrical tapes are developed in blue and black at the initial stage, but at present, they come in a bundle of colors so that you can choose your preferred one as per the electrical wire you want. The 3M company introduced the tape and made of cellophane materials; this is the tape that is used in all our households today for primary sticking options, this is a transparent tape which is used for different purpose like creating craft items, sticking a poster on walls, sealing boxes, etc. Apart from the above adhesive tapes, there are also other variations of tapes namely fiberglass tapes, heat-shrink tapes, fire tapes, cable repair tables, silicon repair tapes and much more used for different applications.